Here's a rundown of a few products that have made my wishlist this year - but be quick, this stuff is selling out fast!!! 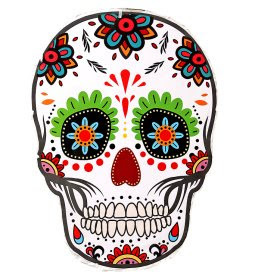 I love Day of the Dead inspired looks [mainly for the pretty skeleton costume designs and the chance to watch pro MUAs to go rogue on their Insta profiles; with glitter, facepaint & talent] and Asda have THE nicest, budget decorations to match. The stuff I'm about to show you is ideal if you're throwing a party this year and want co-ordinated, pretty [yet spooky] decorations for your gaff - which WILL trick your guests into thinking you've spent a pure fortune but WON'T break the bank. The very definition of Trick &Treat. I picked up this pack of twelve paper cups for just £1 online, which I thought was amazing value - and you guys loved these on my Instagram, too. You can order these baddies here, or scour your local Asda store to see if they have any left. All's not lost though - you may still be able to get your hands on this bunting / banner where you are [it's FAB!!!] I've linked it and some of my other fave DOTD picks from the range [all images used below are stock images from the Asda website] rather than trying to buy it all myself. After all, I barely leave the house and have NO REAL REASON to buy any of this stuff; those of you with actual social lives deserve the chance to get your mitts on these bargains more than I do. So I'll leave the good stuff for you guys #Selfless. But yeno, invite me to your party. I'll bring wine? Have I inspired you to throw a party, yet? Got room for a little whopping giant one [me]? What are you doing for Halloween this year? Are you going to / hosting a party? What do you think of these picks? Proper bargains, amiright?